I am writing this from the comfort of our humble home here in our little hometown, Concepcion, where there is no internet connection and has a very limited access to a cellular site. As I write this, I am surrounded by a rice field, lots of chirping chickens, and a cat that loves to eat junk foods (I’m not even kidding, haha!). When I am here, I experience a “forced” social media detox, lol. I miss this life so much – this is the life that I grew up with – a very simple life away from the hustles and bustles of the city. I always think of living this life again with Dane when we grow old. I’m glad I’m here now as I turn 29, every corner of this “kubo” makes me reminisce about my life. 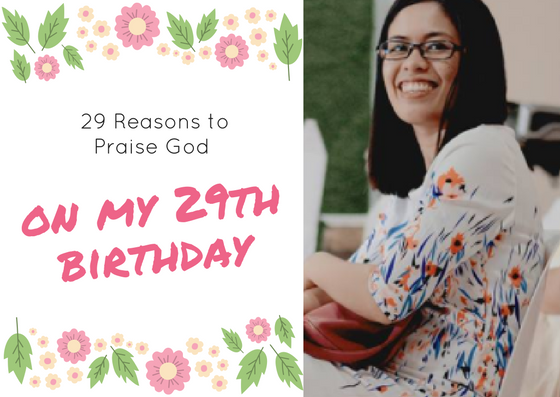 So here’s my 29 praises on my 29th birthday. 1. For the salvation that He gave me which made me very confident that whatever happens, I am secure in Him. 2. That I am alive and that there are people who genuinely love me – my family and real friends. 3. That He gave us a safe travel going here (and I’m confident He will do the same when we go home). 4. For the protection He gave us from typhoon Vinta (I’ll try to write a separate post about this, we literally crossed a flooded area one night and my heart almost stopped beating seeing my brother ride a motorcycle on a leg-high flood with a very strong current). 5. That He always provides not only mine but my family’s needs. 6. That He keeps Dane safe (and that he’s coming home very soon, yiiii! I’m so excited for that day to come! lol). 7. For the good weather that He gave us today (I’m writing this on a cozy December 25th morning). 8. For giving us a good health and that we don’t have a very serious illness. 9. For sustaining the life of my lola and father (lola, who was 90 yrs old was admitted several times this year and tatay just recently had a serious fall while doing a carpentry work here at home). 10. That even though we are not rich, life was definitely better compared to our lives when we were still kids. 11. Because He gave Dane and I a jobs that let us save little by little for our future. 12. Because I know that even though we are away – I know our marriage will stay strong. 13. For the concrete highway here in our small hometown – now travelling going here is a lot more smooth. 14. For the problems He gave us which made us stronger. 15. For all the missing moments which I know will lead to a wonderful reunion one day. 16. For our talkative Nate who makes everyone happy (he knows how to be the center of attraction, hahaha. Grabe ka, Nate!). 17. For the rain He gave – tatay prayed for this for our rice field. 18. For the church in Tagum – they let us stay in the church building during the days that I need to work. 19. For our old family friends we were able to visit and bond yesterday. 20. For my brother and sisters who are willing to help take care of Nate while I catch up some sleep. 21. Because I am who I am now because of Him. 22. For my previous failed relationships that lead me to the right person for me – my Dane. 23. For our 5-year marriage that He blesses always. 24. Because of my parents – they are my happiness and my father/mother of faith. 25. For our cousins who travelled all the way from Cotabato to be with us (I didn’t even know they were coming!). 26. For this blog which has become my life partner – it did not just become my constant company but also an additional source of income. Although not much – every opportunity from this blog is still something to be grateful for. 27. Because He gives me the chance to experience everything that I have experienced as of yet (and more to come). 28. For the faith that keeps me going despite the negative things that happen in my life. 29. And lastly… For this life… He alone deserves all the glory and honor.